Reposting this from my Notes in Facebook. It is because of this post that I realized I want to blog and share what I learned/discovered. 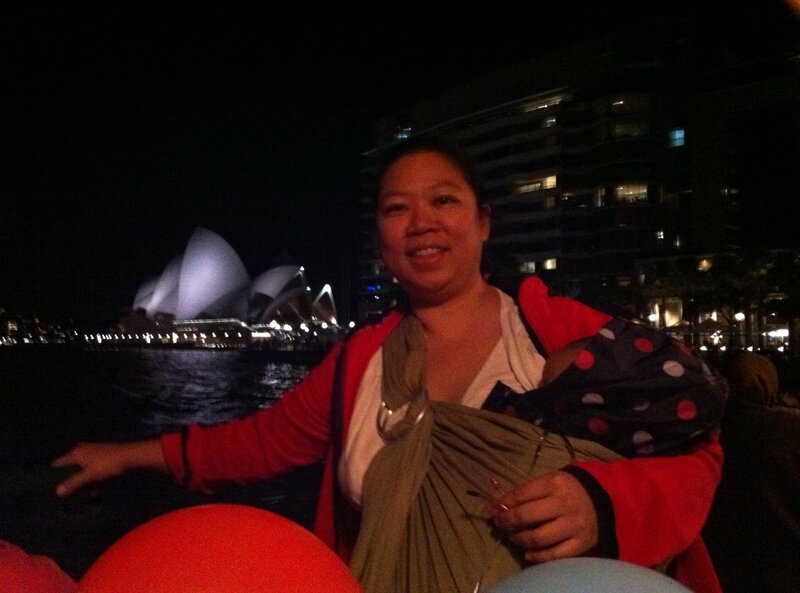 When I first encountered babywearing, my first born Kite was already too old for it. I really wanted to babywear, I see the wisdom in it, you get to be so close to your baby yet your hands can be free. Lucky for me the distributors and makers of the baby slings are N@Wies (Abbie & Rissa for Maya Wrap & JenCCTan for Next9). When I got preggy I knew I will attempt babywearing and wish it is as simple as I thought it would be. And it kinda was. It was scary at first but since am in touch nga with the baby carrier gods, it was easy for me to ask for help. Ok success for me meant I was able to use the one of the slings I bought. But I also read and saw reviews of moms loving other kinds of sling, so I know there’s more out there to conquer. I also knew it will be a lifesaver during travels, so prior to our trip last April I gathered enough friends and organized a Babywearing Meet, from a small group it became quite a medium sized group 🙂 We had so much fun learning different kinds of babywearing. The sling was the single most used item in our baggage during our trip. It was so useful that I am now going to actively talk about it and share my discovery. I know that there are a lot of baby carrier owners who ‘use their carrier. I understand why coz I was kinda scared too at first. I also know some moms just need to be taught, motivated, cajoled as was the case during the 1st babywear meet. That’s why I wrote this entry. Bring whatever sling, carrier you have, or if you wish to try a certain kind out send Abbie Yabut (Maya Wrap), Jen Tan (Next9) and/or Jenny Ong (sells several diff brands of Slings) a message and ask if they can bring, if you wish to buy PM them din to ask them to bring stocks. This is purely a babywear meet, you need not buy nor use their products, they are just going to guide us and share their knowledge. Other users both experts and newbies will be there too to share thoughts and experience. What the heck if you do not wish to babywear but wanna talk mommy talk go na din! Breastfeed, baby care or pregnancy concerns pwede din isama. Remember mommies and daddies ang mga andoon, so we probably have pregger to parents of newborn to teens in the crowd for you to share with. sige punta ako. hihi. para makilala ko na din mga n@wies. time for me to be active again! hahaha. yeebah! one busy saturday (sana hindi traffic ang edsa.. tough wish!) after babywear/sudden make over (pretty please) at citisec seminar naman. see you tomorow!! 🙂 much excited! You are currently reading Babywearing at MimmaBenz.com.